Our event was hosted at a weekly Food Truck event whose attendees match up nicely with that of potential EV buyers. We had a Bolt and Prius Prime from dealerships available for test drives, and local EV drivers brought a Leaf, i3, Tesla Model S and X, and Volt. 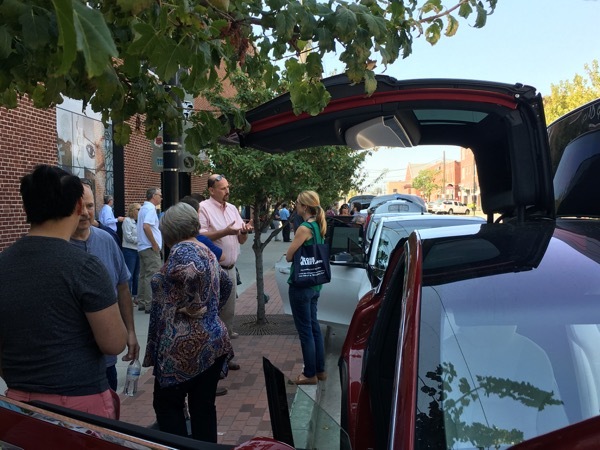 Our local NPR affiliate ran two stories on EVs which included the event in the 24 hours leading up to the event, so that brought many people out as we. It was a fun event, and most of the people who interacted with the cars had never experienced an EV before. Please come out to enjoy Food Truck Wednesday at Guthrie Green and learn about EVs and plans to increase charging in Tulsa! We will have LOTS of EVs and plug in hybrids to show off, including a Chevy Bolt and Volt, Prius Prime, Tesla Model S and X, Nissan LEAF, and BMWi3. Test drives and/or rides will be offered on select models! Registered attendees report 118,391 electric miles driven.